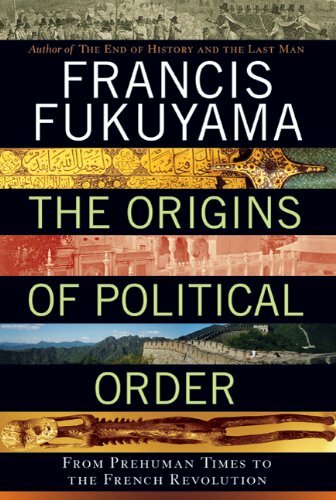 The Origins of Political Order: From Prehuman Times to the French Revolution, by Francis Fukuyama. Farrar, Straus and Giroux 2011. ISBN: 0374227349; 9780374227340. Virtually all human societies were once organized tribally, yet over time most developed new political institutions which included a central state that could keep the peace and uniform laws that applied to all citizens. Some went on to create governments that were accountable to their citizens. We take these institutions for granted, but they are absent or are unable to perform in many of today’s developing countries — with often disastrous consequences for the rest of the world. In The Origins of Political Order, Francis Fukuyama, author of the bestselling The End of History and the Last Man, provides a sweeping account of how today’s basic political institutions developed. The first of a major two-volume work begins with politics among our primate ancestors and follows the story through the emergence of tribal societies, the growth of the first modern state in China, the beginning of the rule of law in India and the Middle East, and the development of political accountability in Europe up until the eve of the French Revolution. Drawing on a vast body of knowledge — history, evolutionary biology, archaeology and economics — Fukuyama has produced a brilliant provocative work that offers fresh insights on the origins of democratic societies and raises essential questions about the nature of politics.